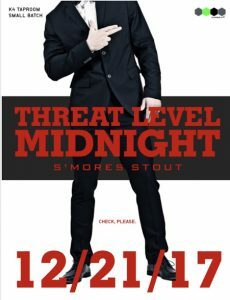 Threat Level: Midnight (S’mores Stout) Release Party! Maybe not as much fun as a pants-on-fire cage match, but certainly as memorable and exciting as attempting to infiltrate the Kremlin after a garlic and chili pepper buffet. What’s that even supposed to mean? I have no clue. But what I do know is that we didn’t pull any punches with TL:M. Everything we could get our grubby mitts on went in the brew: chocolate rye and wheat, caramel rye and wheat, toasted buckwheat, blackstrap molasses, baker’s honey, milk sugar, cacao nibs from Ghana and Ecuador, and then we even set up a hardwood fire behind the brewery and roasted 30 pounds of marshmallows that made their way to the brew kettle. Boom. Your mission, should you choose to accept it….